I've seen much discussion and commentary about transfers on the Forum and I wanted everyone to see another solution to transfering. This system requires that you first engrave a pattern on a piece of steel (or lift it from/off another original engraving) then transfer onto the subject using some every day non-technical supplies. Like other methods, this kind of wax transfer allows you to transfer directly, reverse the pattern, and keep the original pattern for future use. I have accumulated boxes of steel plate transfers that I've used again and again. I was first introduced to the method while doing a project with Colt Manufacturing. 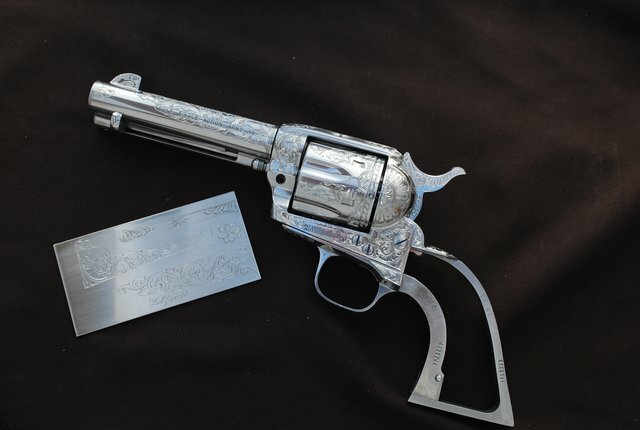 This project included 1,200 Colt SAA Revolvers that were titled the "Old Masters Series," and there were eight engravers on the project The process required that the Colt Contracted Engravers (those outside the Custom Shop) produce a master plate and send it to Colt for approval. Then the master plate was returned to the engraver for direct transfer and engraving on the Old Masters series guns. Below I have placed a photo of another Colt Custom Shop job I did in a traditional Cuno Helfricht pattern using a Master Plate and transfering with wax. I had a matched set of four of these to engrave, so the master plate was a real time saver! You can see one side of the plate in this photo showing some of the original engravings - the opposite side had the remainder of transfer images. In regard to reversing the patterns (like matching scrolls on both sides of the frame or barrel) the process is simple. First do the original pull, place that piece of tape face up on a flat surface, then place another piece of tape face down on the original, then and press to capture the inage, lift and place it on the subject. I estimate that you might loose about 15% of original clarity, but if done carefully, it works just fine. Always remember to fold over a short bit of both pieces of tape so that you can easily peal them apart - if you don't you'll spend a great deal of time cursing me and the tape! Variations.I am including this photo to show a variation in technique. On the left is a positive transfer, and on the right is a negative transfer. The techniques for lifting these two images should be apparent - in one case you fill the engraving and in the other you simply pat a layer of wax over the engraving. If I am engraving a very brightly polished suface (typically on gold and silver jewelry items) I always use the negative...hides the brightness and makes the image more apparent. The other significant fact that you should be noticing here is that unlike a line drawing (via a paper/transparency transfered onto the subject, or drawn directy on the metal) this method provides another helpful advantage for cutting the subject, especially on the negative transfer. Look closely and you will see that the wax transfer reproduces the artistic inflections of my original engraving. These delicate abaresque scrolls have character - that is to say they are cut light to heavy throuough the scrolls. I wanted each cylinder flute to be the same, and with the direct transfer, I can repeat the light to heavy sequences on each flute - they all match exactly because I can see the changes in line depth and width in my transfer as I cut it. Here is the LINK for the video. Mike something wrong with the link. Sorry MD - it should be corrected now. Thanks for sharing that information. I can see how that method works well for small sized transfers. What do you do for larger patterns such as the Winchester 1866? The Scotch Magic Tape only comes as wide as 1 inch. On large areas (like shotgun and rifle receivers) I will typically engrave one side first. Then, using the transfer methods descibed above) I will wax up the engraving pattern and place tape over the entire area - overlapping each piece about 1/4 Inch. Then the process is the same - pickup the entire pattern and make the transfer. At other times it becomes more difficult, and we need to get creative. On a piece where there are lots of curves and obstructions, I can transfer impressions by placing one piece of tape at a time. The beauty of the process is that you can see the transfer images through the tape, so visual registration is not a problem. I spend more time discussing and demonstrating these and other transfer issues in my classes. I added some dialog to the initial Thread to explain the image reversing process. Nice video Mike. I have always appreciated the way you go about explaining anything. After sitting with you as a student and being in attendance at siminars here and there and through our many conversations over the years, one thing remains constant. You don't explain things like an engraver who is trying to convey a message; you articulate it very intelligently like a professor who happens to be an engraver. Very clear and well thought out in your choice of words and not just on video, but everywhere. Thank you for being the professional you are, and thanks for posting the link. I looked it up on their website and the Scotch® Book Tape 845 comes in both 3 inch and 4 inch widths. I found the 1" Scotch® Magic Tape, 1-inch x 2592 Inches, 3-Pack on Amazon.com for $20.51 shipped. That's a lot of tape. I think even that amount of it would be a lifetime supply for me. I'll have to gather the stuff and give it a try one of these days. It never hurts to know more tricks. Mike,Thanks for sharing your wax tranfer method,must try.Doc I told my wife to order the tape from her pay pal,but I got lucky she had some in 3/4in. J.J.
Great and helpful video Mike. Thanks for posting it. I already have some 3/4" Scotch Magic tape and I'll have to dig around in the garage but I know I have a lifetime supply of graphite powder already. I don't have any regular chap stick but... I do have a tin of S.A.'s Transfer Wax. I'm thinking I might just mix up what I have and give it a try. That is a great demo!!! Man you are getting good at YouTube, Keep them coming. On your vise jaws you have some lines and dots are thoses for centering or some other purpose? Yes, the lines are for casual and/or accurate centering - the dots are actually punch marks. I use the dots to set one leg of my compass or divider to strike small arcs. If I need larger arcs I do it with a template, but you will be surprised at how often you can use the lines and dots to do accurate centering, applied geometry and arcs. Very well done. THIS I will use. Tnx! Bookbinding and packaging tape doesn't work well with this method, only the scotch. Great video and much appreciated. Very useful information and everything was clear to see on the video. Thanks, Mike! Good to hear from you Roger, and yes, I will see you in Reno. Nice to see how you transfer Mike! We have got this dutch Labello brand that keeps our lips from breaking in the colder months. Most women carry one around. Don't know about the Chapstick's, but it sounds like its for Chap's only? Mike, this is the basic method that Frank Hendricks taught me when I visited with him in 1984. The only real difference is the transfer medium. He used fingerprint ink instead of wax. I have since used and recommended in my classes for the last 20 years what we used to call Prussian Blue, now commerically available as Dykem Hi-Spot Blue . A 2 ounce tube is darn near a lifetime supply. it would be for anyone starting engraving over age 40. Frank was adamant on the Scotch tape too, and I have tried several modern variations myself since then and Scotch still wins hands down. Thanks for the info Scott - I'll order up some Dykem and give it a try. I can see why Frank would have used this method of transfer since he was invloved in engraving for Colt as a commission engraver. I don't know the history of his involvement, but I would not be surprised to know that he may have initiated the technique. I'll order up some Dykem and give it a try. I like to experiment and try new techniques... so, I ordered out a lifetime supply. That's is a great tip,thank you.It came at the right time too !! You know what, there are so many of these helpful things out there that it helps to mention them now and then . I'm sure that engravers have been using wax transfer methods long before you and me. Still, we keep circulating tips and techniques because new engravers keep coming and they need to learn what we know. We have the web, we have books and we have dedicated instructors who continue to foster the art of engraving. Never miss an opportunity to share the knowledge! And, never miss a chance to learn something new and archive it for possible use later. Mike, You could go down there where we bought those dessicant filters for our air supplies that day, I bet they have that dyekem on the shelf; very common stuff. Somebody there in "stop light city" is bound to have it, maybe even harbor freight. I thought they were the same thing. I think Steve is using that dykem to do the "touching" for the scrapping of his shaper parts. I'm gonna try this method tomorrow. Thanks for the video, always good to learn more. You are likely to find prussian blue/bearing blue in most automotive stores, failing that any engineering supplier worth their salt should have it! Thanks for another great tutorial Mike. It is always nice to know different ways to do things. Having worked in Tool & Die we would use Prussian Blue or Blue High spot or Blue Hit as the stuff is sometimes called, but I have used Blue oil paint as well as yellow. Sometimes we would put Blue on one piece and yellow on the opposing piece then mate the two. the point is Blue oil paint will also do the job. I just found a tube of DYKEM High Spot Blue a local machine shop supply business. By-Golly it does work as well or better than Chapstick! It has a very dark blue clor (like the other Dykem stuff I've used for layout). It transfers very easily, and because it's so dark, it shows up well on bright steel - better than Chapstick. I think that Brownells has the blue as well as inletting black that probably will work too. I will try both and let you know. Thanks for the video Mike! Do you lightly scribe the wax design after transfer? I would think that the wax would be real easy to smear when engraving scrolls and turning the vice. Doc... check out post #42. I think even Mike has given up on the chapstick method by the sound of it. 1) I always use my pinky finger to pick up and apply the Chapstick - and I wipe it off my finger on my pants. I guarantee you don't want to do that with Dykem!! 2) I first tried the Dykem three days ago...and my pinky is still has a faint coat of Cobalt Blue!! 3) I'll never give up my Chapstick for small transfers! 4) I'll use Dykem when the size and complexity of the inlay dictates - BUT - I'll be really careful about wiping it on my pants, and I'll cover my pinky with something....got any suggestions? I think it works a lot better if you wipe it on one of your wife's good hand towels! In the past I have purchased Dykem or the Permatex equivalent at an auto parts store ... it is used in setting ring / pinion gear mesh on car differentials. Great video. I recall that you showed me this method the first time we got together, but with plain chapstick, without the graphite added. I later tried rubbing the engraving with a soft pencil, wiping off the exess, then adding the chapstick. The chapstick picked up the pencil dust oiut of the cuts and made a nice, visible transfer. It hadn't occurred to me to add powdered graphite to melted chapstick. I will try that.